Jacob deGrom is a postseason hero -- and now a chicken cutlet hero, too. For Mets fans, deciding which hero to get at Se-Port Deli in East Setauket is becoming as difficult as deciding which young pitcher they'd prefer to start an important game. But having multiple options, whether for pitching matchups or for lunch, is a great problem to have. Se-Port long has had a hero named after Stony Brook native Steven Matz, a regular customer when he was attending nearby Ward Melville High School. Matz made a surprise appearance at the deli in June, the day after making his major- league debut with the Mets. He was accompanied by deGrom. After deGrom's visit, owner Wisam Dakwar expressed interest in naming a hero after him. The following day, deGrom was asked what he would like on it. "Roast beef, cheese, honey mustard," deGrom said. "If I had to pick, it would be something like that." Dakwar said if the Mets advanced to the World Series, he would give deGrom his own official hero. After the Mets swept the Cubs to win the National League pennant Wednesday night, "The Jacob deGrom" was added to the menu. 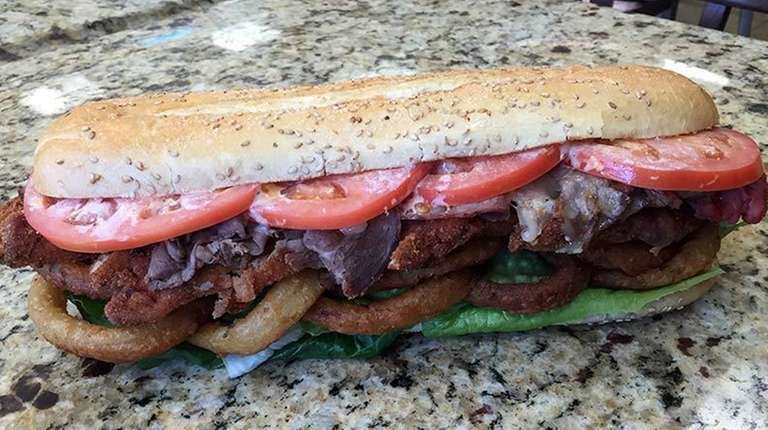 It consists of chicken cutlet, roast beef, melted muenster cheese, onion rings, lettuce and tomato with ranch and chipotle dressing on a toasted garlic hero. "We had to pick out some ingredients that resembled his personality," Se-Port chef Brian Adwar said. "He mentioned roast beef so we got that. Chipotle dressing, which is a little spicy and strong, like his pitching. Ranch dressing, cool and smooth. I think he would like it." Whether deGrom will order the hero that bears his name -- unlike Matz, who ordered "The Boone" during his last visit -- remains to be seen. Adwar said "The deGrom" has been selling steadily and that "The Matz" remains a top seller. Also on the menu is "The Murphy," but don't get carried away. That hero was available long before Daniel Murphy's postseason heroics during the Mets' run to the World Series. Dakwar doesn't remember whom the hero originally was named after but joked, "If fans want to say it's 'The Daniel Murphy,' that's fine with us." When the World Series comes to Flushing next week, Dakwar said he wants to make a special delivery to Citi Field. "I would love to send three 6-foot heros for the players," he said. "I'll send 'The Matz,' 'The Murphy' and 'The deGrom.' "
So the heroes can eat their heros.